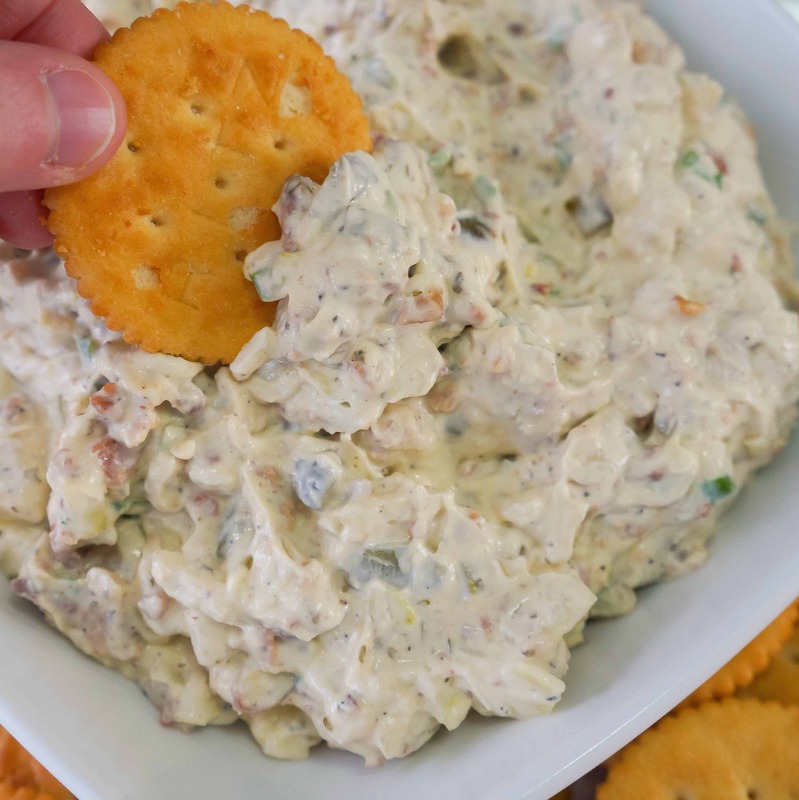 If you’re looking for a tasty dip recipe for your next party you’ll love this Bacon and Onion Dip. 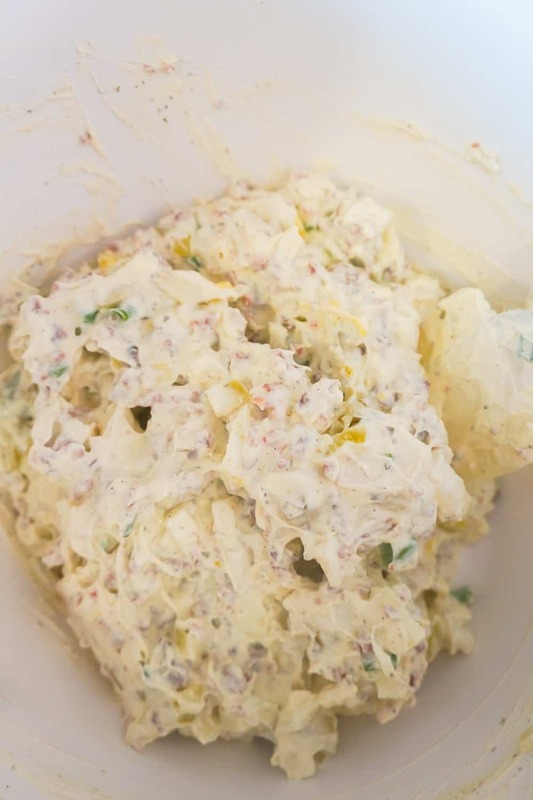 This dip serves 6-8 people and takes only 10 minutes to whip up! 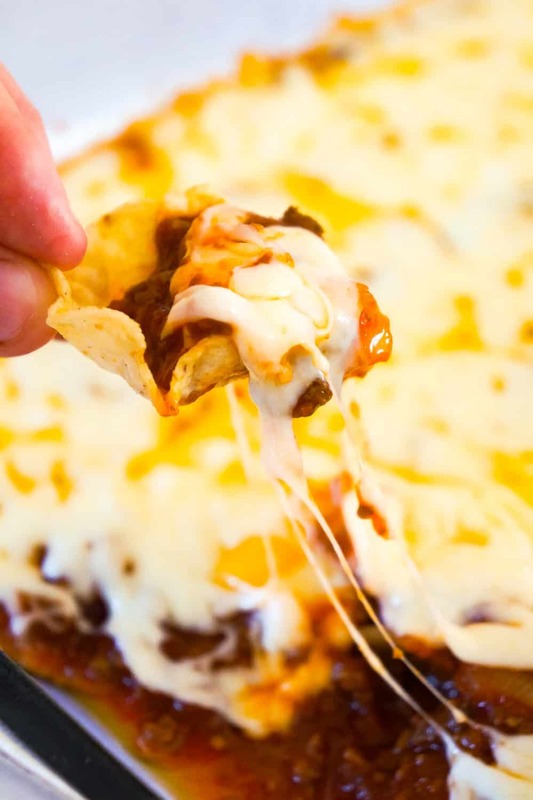 Dips are the best party food. They are super easy to make and everyone loves dipping crackers, chips and veggies. I often make ranch based dips but these time I wanted to try something a little different. I love Herb and Garlic Cream Cheese on bagels so I thought why not try and turn it into a dip for my crackers. 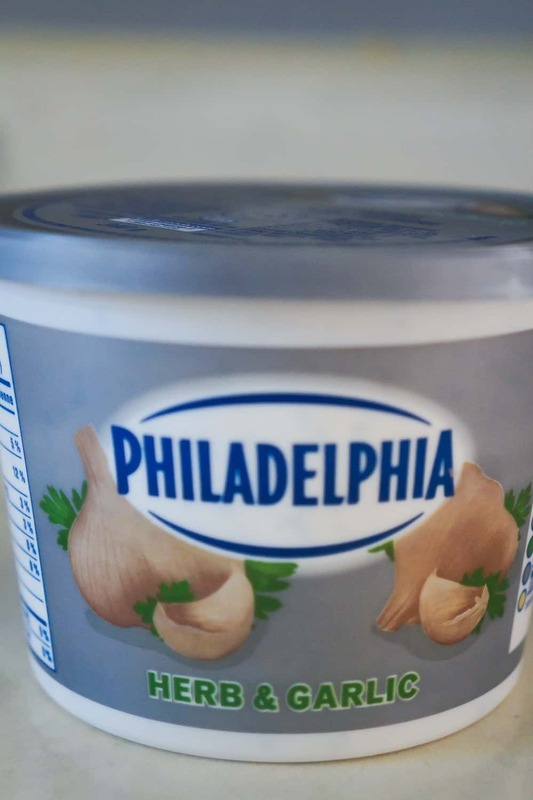 When I think of savory cream cheese recipes I always think of bacon and onions so I set out to make a bacon and onion dip using Herb and Garlic Cream Cheese. 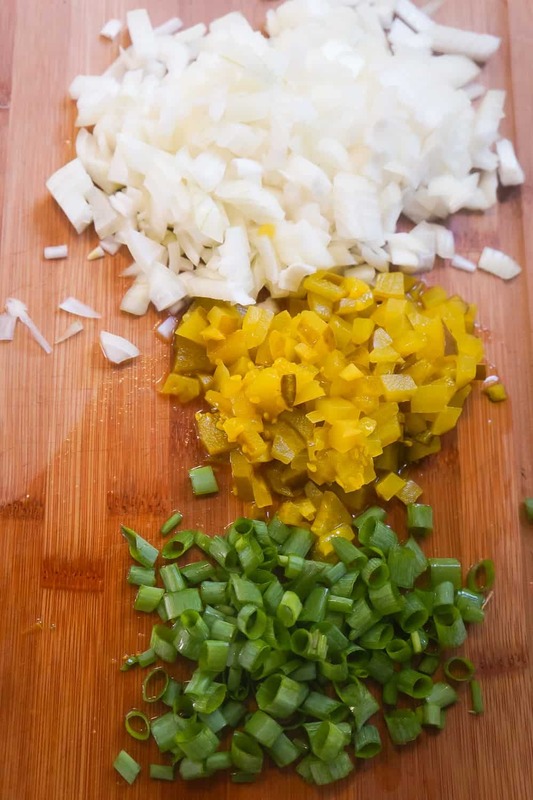 I started out by chopping some yellow onions, dill pickles and green onions. 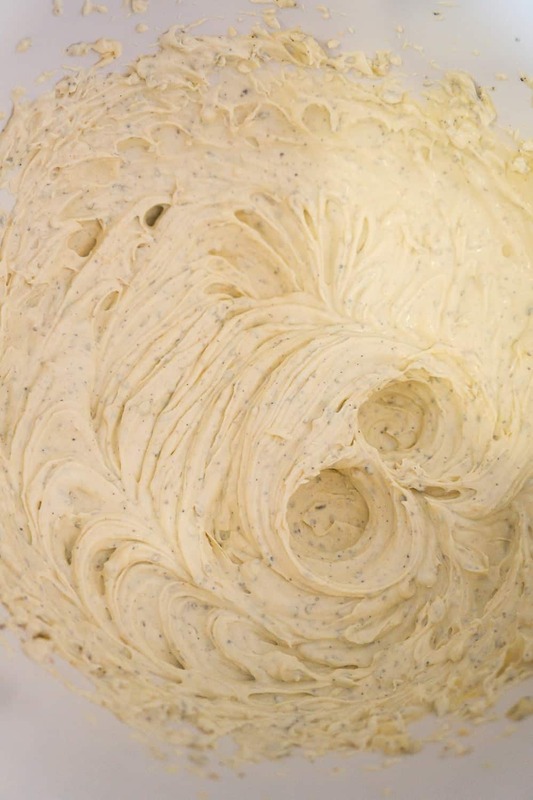 Then I dumped some Herb and Garlic cream cheese into a mixing bowl along with some mayo, mustard and seasonings. I used an electric mixer to combine all of the ingredients. Then I added in some real bacon bits, diced onions chopped green onions and diced dill pickles. I used both yellow onions and green onions to get a strong onion flavour and the dill pickles give the dip a little bit of a tart kick. I stirred the mixture until all of the ingredients were well combined. Serve with your favourite crackers, chips or veggies. I personally love this dip with Ritz crackers. 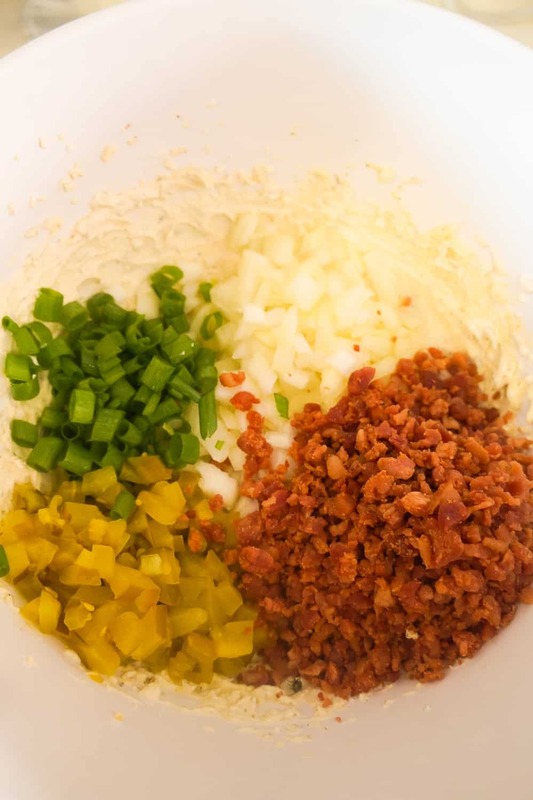 This Bacon and Onion Dip is going to be one of my go to party recipes from now on. I am in love with the flavour and the texture is pretty awesome too. This dip is nice and thick but not so heavy that your cracker will break when you try to scoop it. You can enjoy this dip right away but I find you let it sit in the refrigerator for at least two hours before serving. 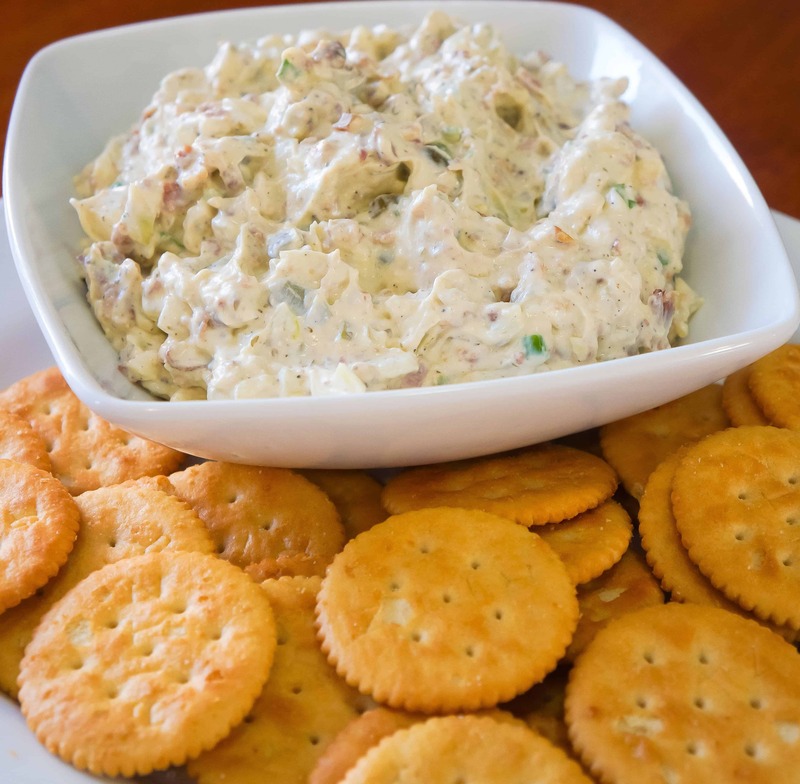 Next time you’re entertaining pull out this Bacon and Onion Dip recipe. If you’re looking for more great party food recipes, check out Sweet Chili BBQ Chicken Sliders, Chocolate Peanut Butter Cheesecake Dip and Basil Pesto Chicken Salad Dip. 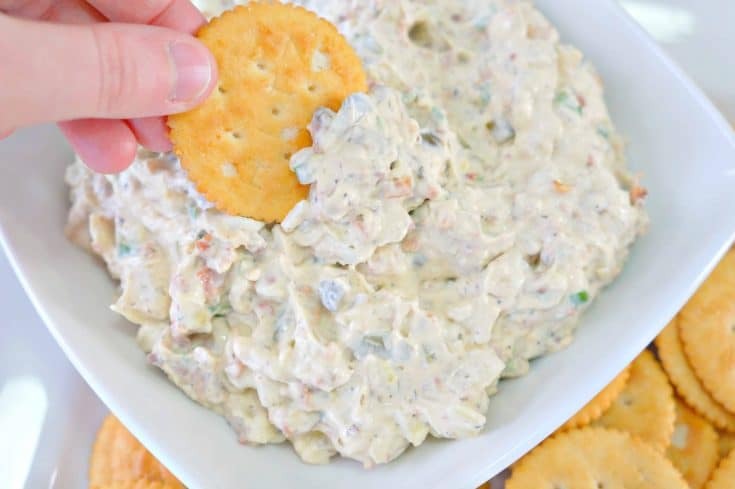 Another delicious cold dip recipe. 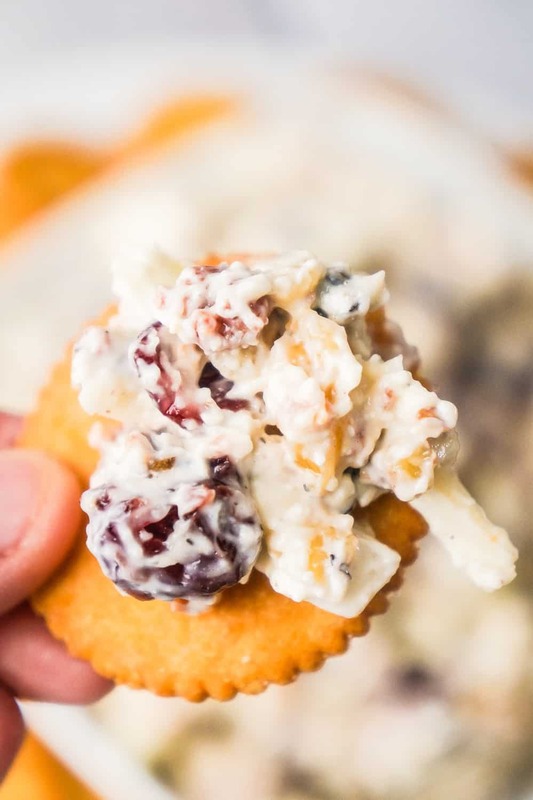 Check out Bacon Cranberry Walnut Dip! 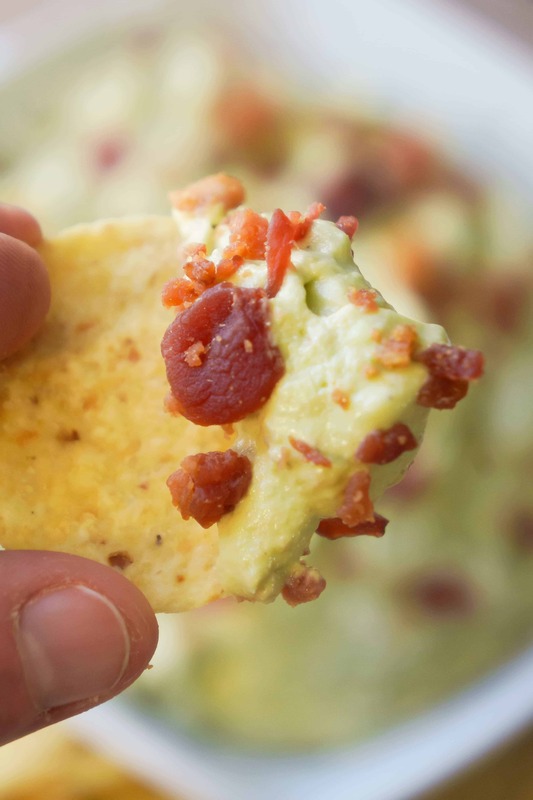 Be sure to also check out Bacon Cream Cheese Avocado Dip! 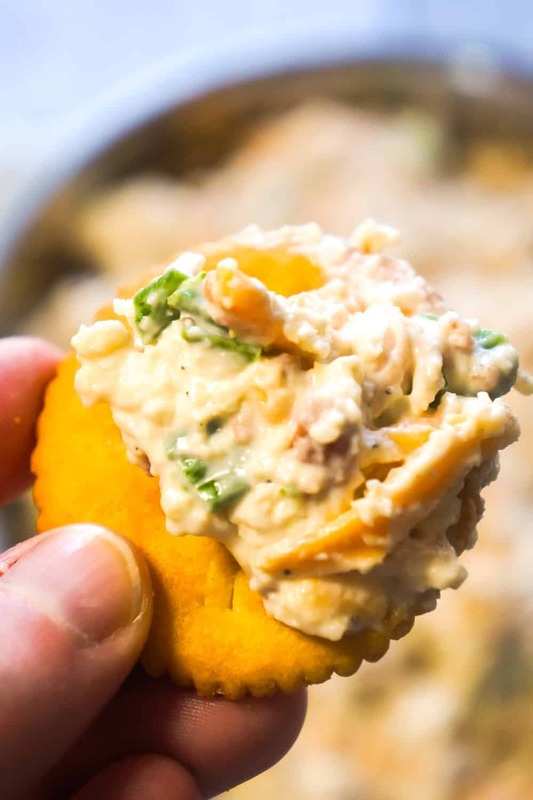 This Bacon Cheddar Chicken Salad Dip will be a hit at your next party! 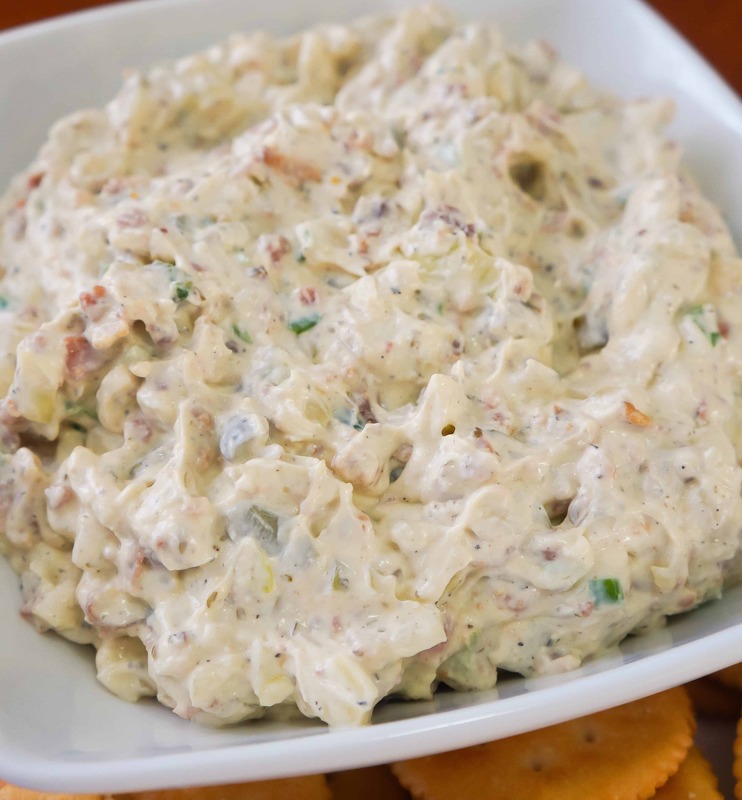 Bacon and Onion Dip is an easy party dip recipe made with herb and garlic cream cheese. 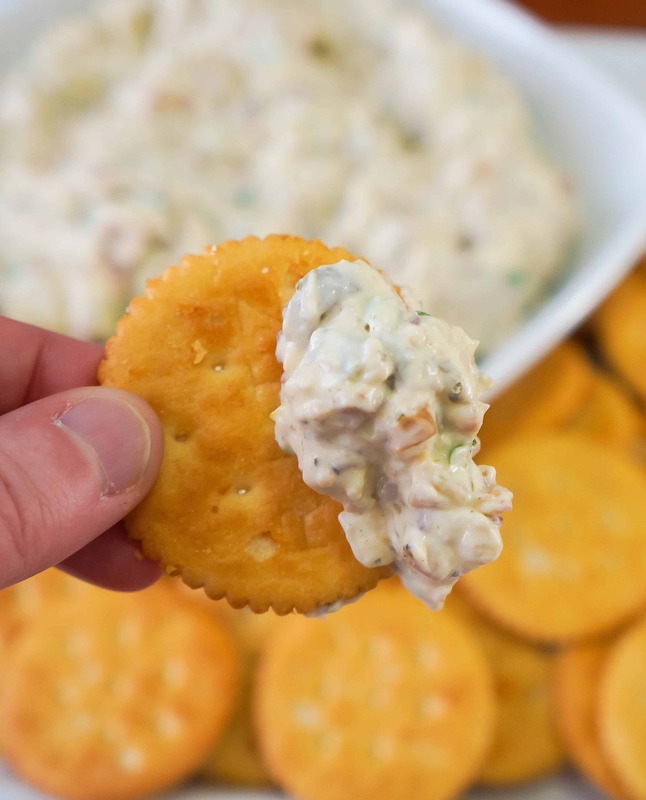 This cold cracker dip is loaded with real bacon bits and diced onions. 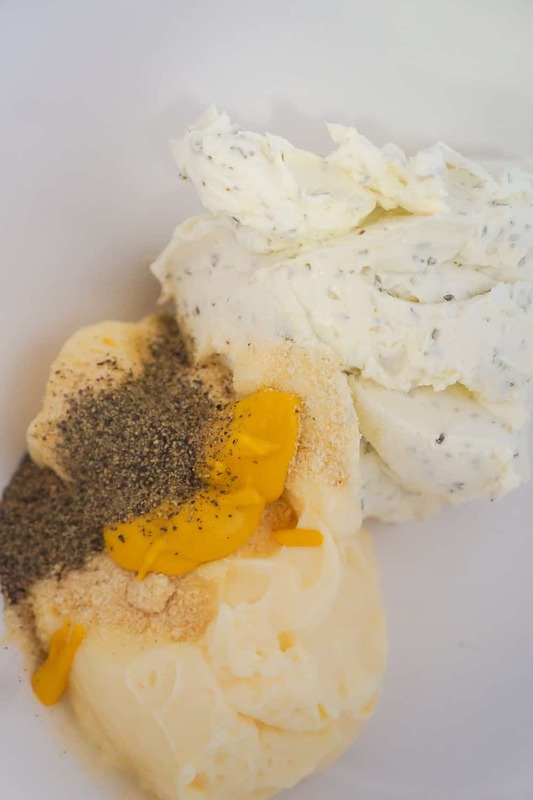 Combine cream cheese, mayo, onion powder, mustard and pepper using electric mixer. Stir in onions, bacon and pickles. Can be served right away but best if refrigerated for at least 2 hours before serving.